In 2012, I worked as a chaplain intern at the Metro Transitional Center in Atlanta, a minimum-security prison that provided re-entry programming for women. Week after week, I would watch women participate in job readiness and job search programs, substance abuse treatment and learn how to navigate a world that for many, was new to them. The goal of this program and others like it, is to prepare individuals who are released from prison with the life skills it takes to stay out of prison. Statistics show, however, that the possibility for convicted offenders to return to prison is likely; a 2005 report from the Bureau of Justice Statistics states that 67.8 percent of released prisoners were re-arrested for a new crime within 3 years, and 76.6 percent were arrested within 5 years. In fact, 36.8 percent of released prisoners are arrested again within six months of release, 56.7 percent within the first year. But there is a shift in the trends: the Bureau of Justice Statistics show that 42.3 percent of released prisoners are neither arrested or return back to prison within five years of release. That may be thanks to programs like those at the Metro Transitional Center and the T.O.R.I. program. T.O.R.I., the Texas Offenders Reentry Initiative founded by Bishop T.D. 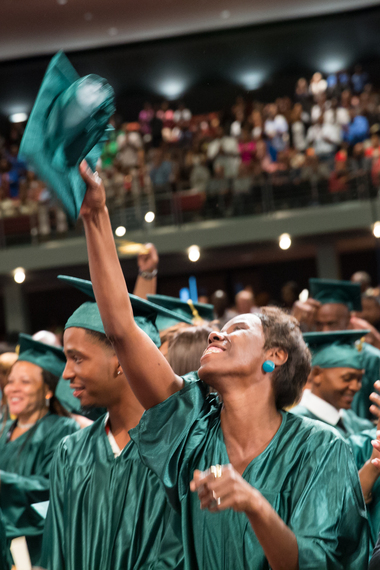 Jakes of the Potter's House in Dallas, and under the direct leadership of Executive Director Tina Naidoo, T.O.R.I., is one the most unique programs of its kind. T.O.R.I. 's 10-year track record has produced award-winning results as a premier program to reduce recidivism in Dallas and surrounding cities. Established in 2005, T.O.R.I. is an intensive 12-month case management program that offers six core services: employment, housing, education, family reunification, health care and spiritual guidance that help rehabilitate ex-offenders and reintegrate them into society. Men and women who complete the program often have no further arrests or run-ins with the law. On July 26, T.O.R.I. commemorated 10 years of service and graduated 100 ex-offenders that have completed the program. 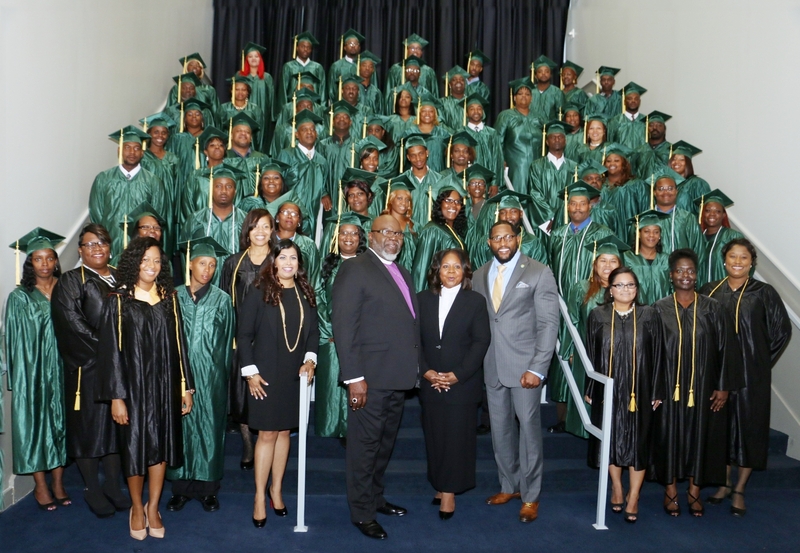 With 8,000 people in support at Jakes' Dallas church, the graduates were encouraged by Jakes and two-time Super Bowl winner Ray Lewis who challenged the graduates to use their newfound "tools" to meet their goals: "Write the vision and make that vision plain," he said. "The difference between a goal and vision is that vision is written down." 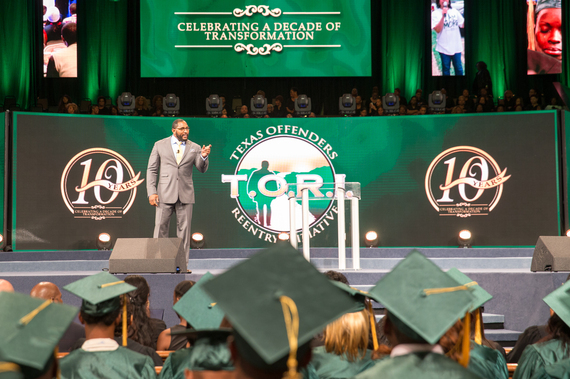 Lewis, who has overcome his own legal troubles, can attest to what it takes to change the trajectory of your life: "And when you start to reach for your new vision, watch those who you choose to invite in your comfort zone. I can tell your future by the crowd you keep." Upon receiving their diploma, each graduate had their name, new business relationships and future endeavors read by dignitaries present. They also received a personalized copy of Jakes' book Destiny: Step Into Your Purpose (set to be released August 4, 2015) and had their program diplomas handed to them by more than a dozen criminal court judges. What a shift it must have been to have judges who once issued sentences in prison to offer them a new lease on life. One of those graduates is LaDaryl Fisher. After two years of prison, LaDaryl would return to his community only to be shunned and abandoned by his church because he was a felon. With no one to turn to and years of drug abuse following him, another arrest would lead to an additional five years in prison. When he was released again, he would find his life as a free man the same way it began: "When I went to prison, I had nothing. When I came home, I had nothing. My mother was gracious enough to let me parole to her house and I had to motivate myself to start from nothing and build a life for myself." The transition home wasn't easy. "It's easy to look for all the negatives -- what you don't have, who you used to be. I had the mindset that I was smart, capable and God created me so I had everything I needed in me to prosper. LaDaryl would spend the next 12 months in the T.O.R.I. program working to learn the life skills necessary to live independently. Currently working as a foreman in construction and attending college courses to become a certified electrician, Sunday he stood before all of the T.O.R.I. graduates, faculty, staff and supporters as the class salutatorian. "People have to believe that [life] will get better. You just have to be patient." Both LaDaryl and former client-turned-staff-member Shanita Mayberry attribute much of their success to the staff at T.O.R.I. The case managers at T.O.R.I. really work with you step-by-step to make sure you learn how to prioritize your life. I was able to learn how to prioritize everything I had going on from requirements with court and probation, figuring out my commute, employment coaching classes, everything. My case manager even showed me how to sell myself to employers and look for a career and not just a job. Graduating from T.O.R.I. in 2010, Shanita actually started the program twice. The first time, a life of drugs pulled her away from finishing the program. "The first time I attended T.O.R.I. I only went because it was required for probation. I wasn't ready to change my life -- so I went on the run from the law and when I was caught, I had the option of going back to prison or entering rehab. I chose rehab. It was there I decided that I would change my life for good." After successfully completing T.O.R.I., Shanita would volunteer in the office offering her administrative skills while she looked for employment. It wouldn't be long before people would notice her undying commitment to her work. "I was a contract employee for T.O.R.I. in 2010. By 2012, they offered me a full time position that would allow me to work and take care of my children." LaDaryl mirrors Shanita's sentiments: "[The staff] are God's chosen people. It really takes a special person who hasn't been in your situation to offer you all the resources it takes to help you." He continued, "They don't judge you. The program offers you a feeling of hope. The program taught me what it meant to forgive. If you want people to bless you and move forward despite your past, you have to learn to do that for others. This program taught me how to do that, too." Jakes' hope is that the T.O.R.I. program will expand to cities across the country. The model is effective in helping people who have been in prison reclaim their lives through a holistic approach. There's work we can do, too. We are called to help the imprisoned to embolden themselves to change the course of their lives and pursue their destiny. Paul reminds us in Hebrews 13:3 that we are to "remember those who are in prison, as though in prison with them, and those who are mistreated, since you also are in the body." No matter who you are are what walk of life you're from, every community feels the effects of those who are imprisoned, even more so when they are released back into society. Because of this, we are called to remember and act on their behalf as Jesus called for in Matthew 25 when caring for the sick, giving to the poor and visiting the imprisoned was a critical part of doing the work of God. Our work on the behalf of the imprisoned and those on the mend through re-entry is a divine work -- a work we can do together. To learn more about T.O.R.I., its programs, and how you can get involved, visit. http://medc-tori.org/.